Everton gained safe passage to the third round of the Carabao Cup courtesy of Gylfi Sigurdsson and a brace from Dominic Calvert-Lewin in front of just under 32,000 inside Goodison Park. The League, now Carabao, Cup hasn’t been a happy hunting ground for Everton. 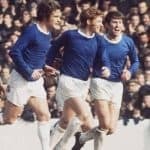 Twice losing finalists, to Aston Villa in the late 1970s and ‘them’ in 83-84, it’s high time Everton corrected that miserable record. For this opening game of the Carabao Cup, Marco Silva made eight changes to the side that started at Bournemouth: Stekelenburg, Digne, Zouma, Holgate, Kenny, Davies (c), Dowell, Sigurdsson, Ramirez, Niasse and Calvert-Lewin. Our visitors from South Yorkshire, lying 15th in the Championship after five games, arrived at Goodison fresh from a victory over Millwall, but for the first time since a League Cup tie in 92-93 that the Blues won 3-0. Millers manager Paul Warne said, “I expect Everton to play a vigorous, high tempo game and look to put us under a lot of pressure. We’ll need to match them for intensity.” He selected his starting eleven: Pryce, Vyner, Robertson, Raggett, Mattock, Forde, Palmer, Ball (c), Wiles, Newell and Proctor. Our referee was Graham Scott. Rotherham had the better of the opening stages as Everton, with so many changes, looked nervous and struggled to get going. When they did, a good move started by Kenny and involving Niasse, Sigurdsson and Digne raiding down the left side ended with the shot from Niasse being blocked. Everton were still taking their time to settle and didn’t force Pryce in the visitors goal into making a save till the 20th minute. Davies found Sandro wide right and his low cross evaded DCL to reach Sigurdsson and his side footed shot was gathered at the second attempt. Everton opened the scoring in the 28th minute as Kenny found Ramirez on the right flank and his low cross come shot found Sigurdsson sliding in to beat Pryce. From the restart the Blues had a lucky escape as a free kick from the left skidded off the head of Kurt Zouma to go narrowly wide of the post. Everton responded with Ramirez switching to the left and firing in a rasping shot that Pryce spilled but Sigurdsson was unable to convert the rebound. Rotherham were still competing and should have levelled when a left wing cross from Newell found Raggett in space in the Everton penalty area, but he skewed his shot horribly wide. Pryce made a smart save to deny David from twelve yards after Ramirez had won the ball and played Sigurdsson to the bye line for the cut back cross. Digne and Niasse linked on the left and Niasse on the bye line delayed before beating his man only for his low cross to go right through the six-up yard area to safety. The final chance of the half saw Ramirez release Kenny on the right and his cross was met by Niasse, but his volley went high and wide. Only one change during the interval, Rotherham taking Wiles off in favour of Waulks. Everton started the second half more confidently and a great cross from Ramirez was just too far in front of a diving DCL. Lucas Digne picked up the games first yellow card for a stiff challenge. Zouma was flattened by a flying elbow but referee Scott waved play on while Marco Silva fumed at the fourth official. Vassell for Ball on the hour mark was the visitors second change moments ahead of the Blues doubling their lead. A free kick from Sigurdsson hit the wall but Lucas Digne latched onto the ball to send a cross to the back post for DCL to nod home. Ramirez with another fine cross on 65 minutes found Niasse in space, but his header was way off target. A flurry of changes saw Theo Walcott replace Sigurdsson on 66 minutes, Taylor replace Newell on 71 for Rotherham and Cenk Tosun replace Niasse on 73. It was the 87th minute when Stekelenburg made his first save, going full length down to his right to turn away a shot from Taylor. But from the corner, Everton conceded far too easily as Waulks escaped his marker to plant his header beyond Stekelburg into the far corner. Stung by the goal, Everton went straight down the other end and a good move was excellently finished by DCL with a curling shot the goalie had no chance with. In added on time, Tosun tried his luck from distance with a firm shot that Pryce dealt with fairly comfortably. There were fine showing by Dowell, Digne and Ramirez, but the centre of the defence still needs some serious attention.